Types of Art: The Marka are a Mande subgroup. This ethnic group is independent from the Bambara but their styles show a strong Bambara influence. The Marka are famous for their masks and puppets. 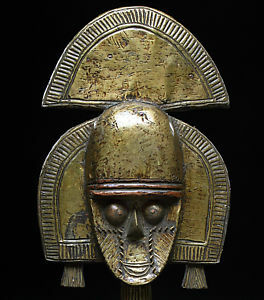 Similar to Bambara's ntomo society masks, Marka masks are generally carved with horns, comb or crest on top of the head, but unlike Bambara masks they are often covered with metal sheeting. The Marka dress their masks in gaily-colored costumes made of cloth; they always appear in pairs, to represent man's courting of woman.